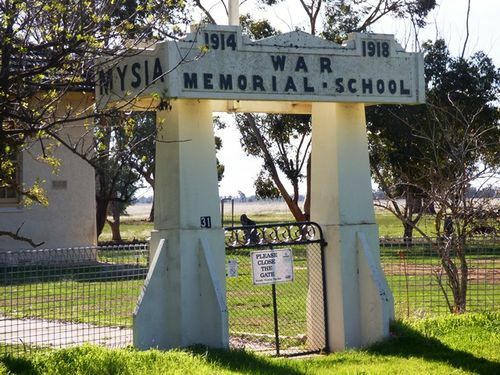 The Mysia War Memorial School was originally erected to commemorate those from the district who served in World War One and as a lasting memorial to those who lost their lives. The school was opened on the 9th November 1921. An additional plaque was added to the school to commemorate those from the district who served in World War Two. His Excellency the Governor (the Earl of Stradbroke) completed a visit to the Mysia and Boort districts on Friday, November 11. On Wednesday, in company with Messrs. Angus and Weaver, M.L.A. 's, and the director of Education (Mr Frank Tate), His Excellency opened a memorial school at Mysia, towards the cost of which the residents had subscribed £500. On Thursday morning the vice-regal party motored, to Boort, stopping at Southerton Vale, the homestead of Mr. Weaver. Nearing Boort there was another halt at Dunbar, the home of Mr. Robert Coutts, and the first farm to be settled in the district. In the presence of a large gathering. His Excellency unveiled the soldiers' memorial in the town. Australasian (Melbourne, Vic. : 1864 - 1946), Saturday 19 November 1921.
Who Foremost Fighting - Fell. This Stone Was Laid By Mrs Thos. Chalmers Senr. World War II 1939 - 1945.